Hi guys. I’d like to welcome you all in the New Year. The New Year’s Eve parties are over, but I believe you spent a good time celebrating the New Year and let us hope that the year 2019 will be a year of prosperity, success and happiness. And talking about happiness, today I would like to talk about it, this very feeling, among other things. I would like to talk about emotions and how to express them in English. There are lots of phrases that well describe how you feel. The language offers a wide range of expressions to choose from and this is what we’ll be talking about today. The emotion or these emotions that we will be dealing with today are very well connected with my private life. I want to share some news about my private life. I will be talking about some events that have recently happened and that evoked certain emotions, two completely different types of emotions that is happiness and sadness. These emotions are connected with changes. This is what I experienced recently. My life has changed, it has changed in the very positive but also a very negative way, unfortunately. But let us start from the very beginning. I will start with the emotion of sadness, because they say, and that’s a very interesting thing, that if you have two pieces of news, one is this positive piece of news and the other is the negative piece of news, you always shall start with the negative one because then you will finish your story with the positive emotion and it will leave you in a good mood. So we are going to start with a feeling of sadness and how to talk about it using different idioms and idiomatic expressions. But before I introduce these phrases, these expressions, before I tell you or teach you how to do it, how to express the emotion, I will introduce a story, a background story that will tell you what has happened and why I have experienced this feeling of sadness and how my life has changed. The dog – this feeling of sadness is connected with the dog. Those of you who listen to my podcasts and those of you who have listened to podcast number two, they know very well that I love dogs, that there are, and well, if I say there are this is not actually true because now I would have to say that there were three dogs living with me, with us in our house. But unfortunately, one of them just passed away and that is why I have experienced this great feeling of sadness. And I will tell you what happened and why, unfortunately, we had to say goodbye to one of the dogs. So, at the beginning, at the very beginning there were three dogs, as you know, two pedigree dogs and one mongrel and they lived happily together with us. I have described lots of stories connected with them. I have told you some of the experiences that we have had with them and they brought so much joy into our life, so much happiness that it is actually very difficult for me now to go through it, to experience this sadness, to experience the feeling that, unfortunately, there are only two dogs left. The reason why one of the dogs is gone is that she fell ill. You know that the dogs they were all girls. So that’s why I called her a „she”. She developed a very serious illness. It was very difficult to diagnose her. At first, we just thought that it is a temporary thing, that she will take some drugs, we will help her and she will be all right, but unfortunately, the more we went to the veterinarians, the more we diagnosed her, it turned out that the illness is very serious because she fell ill with cancer and we did our utmost, we did whatever we could to save her, but unfortunately that wasn’t possible and that’s why she’s no longer with us. So you can believe how sad I am, how said I was and the feeling of sadness is something that was with me, with my family or has been, actually, because it hasn’t finished, so this feeling has been with us for some time now. And I have decided to tell you how to talk about this feeling of sadness using other expressions than just sad, I’m feeling sad because this is something that everybody can say, right, when there is some negative event that happens in your life, you simply can say that you feel sad. But the language, English, because this is the nature of the language, it offers a wide variety of expressions to choose from. And as you know, in order to learn these expressions, you have to understand the context and you have to know where they come from. So, that is why I will tell you today how to talk about the feeling but also how to understand the phrases because if you understand them if you understand the context the structure if you know where the phrase comes from or what we shall associate this phrase with, it is simply easier to remember the very expression. So let us start with the expressions that describe this very unwanted feeling of sadness. So, instead of saying that you feel sad, you can say that you feel blue. The expression feel blue, I guess, it is well-known also in Polish because this is the kind of feeling that we can have after coming back from holidays. I don’t know if you experience it. But if you go on holiday and you have this great time, a lot of relaxation and then you have to come back to work, there is this feeling of sadness and then we can say that we feel blue and because this is a very negative emotion, we call it that we feel blue. Another expression is face like a wet weekend. That’s an expression that needs a little bit of explanation from me, why we can, why we say that that your face is like a wet weekend. I believe that you well understand the expression wet weekend and the wet weekend is connected very much with with the weather because the British, when they describe different emotions, not only emotions, but when they use some idiomatic expressions, very often they refer to the weather. You know it, right, so in England when you don’t know what to talk about, you can always talk about the weather, just look out of the window and demonstrate the weather that is outside. So as I said, the expression can be used in a sentence that your face is like a wet weekend and it comes from this experience that when you want to go outside and you want to do something outdoors, but the weather is ghastly, the weather is bad, it ruins your plans. And if you feel sad, you can say that your face is like a wet weekend because the weekend, the wet weekend, the rainy weekend ruins your plans, and of course, it evokes the emotion of sadness. You can also be down in the mouth. This is also quite easy to remember why we are down in the mouth because when somebody is sad and when you look at their mouth, the corners of the mouth go down and for this reason we say that somebody is down in the mouth. There is also the phrase saying reduced to tears. But you have to be very careful how to use it because you reduce somebody to tears. So, if there is this negative emotion this negative event, somebody can reduce us to tears. So let’s say that you trusted somebody very much but they deceived you and we can say that this person reduced us to tears or there can be this very demanding boss, let’s call him or her this way, and if somebody expects so much from us on one day, then we can say that this person reduces us to tears. And you can also cry your eyes out when there is this negative emotion, and I believe that this expression is very close to what I felt when the dog passed away and I believe I can say that I just cried my eyes out because I miss her so much that it is actually very difficult to describe but I am referring to the language because I believe that the language and different expressions will help me here. And as I said. I cried my eyes out because of the dog and I can also say that I have a broken heart. If you have a broken heart, you are devastated, you are super sad. Another type of this expression to have a broken heart is to be broken hearted. So I am broken hearted and I have a broken heart because I had to say goodbye to the dog that I loved so much. If there is this collection of very negative events, if there is this collection of some situations that make you very sad, you can say that you fall to pieces or fall apart and I have to tell you that just a couple of days after her deathI, fell to pieces, I fell apart and it was super difficult for me just to wake up in the morning and just function, because of the sadness and because I miss her so much. I use the expression „miss her” because I still do. My heart, this broken heart sank. This is yet another thing you can say when you are very sad. So your heart sinks. I hope you well know where the expression sink comes from because it is the ship that can sink. So if your heart sinks, it disappears under the water, so it is so sad that it cannot float on water, it just goes under. You can also have a lump in your throat. So there is this thing sometimes when we are so sad, very often it is connected with tears. We cannot produce any voice. We cannot say anything because there is this lump in our throat. We have it in Polish and there is the same kind of expression in English, and talking about this lump in one’s throat, you can also have a frog in your throat. The expression to have a frog in your throat, it is not connected with sadness. I believe that it can have this very funny association, but I decided to introduce it here because you will see that you can have different things in your throat and that it expresses different things in the language. So, if you have a lump in your throat, you are very sad and you cannot produce any words, but if you have a frog in your throat, you have this feeling of being ill, so there is this thing, this liquid, so to say, that makes it difficult for you to speak but it is not connected with the feeling of sadness. If I am to sum up what I’ve just said about these emotions and about the feelings of sadness, I would like to tell you that I will remember her, I mean the beloved dog, forever because she brought so much into our life and I will have her in my heart although I am devastated, although I’m heartbroken, although I cried my eyes out. I try to stay positive and I try to keep her in my heart and I know I will remember her forever. But I also told you that today we’re going to talk about happiness because apart from this very negative event that happened, apart from the loss of the dog, there is also this super happy event that happened in my life and it is in some way, how funny is this, but it is in some way also connected with with the dog because the dog was diagnosed with the very serious illness and when we heard the diagnosis, I mean when we heard that it was cancer, we knew what would happen, I mean, we expected. We did our utmost to help her but when you hear the word cancer you know that the worst could come or can come. And this is what we felt but the news, the news that she was suffering from cancer, came to us on the very same day when I gave birth to a son. So as you see, my life has changed, my life has changed completely and forever and these emotions of happiness and sadness, they are interconnected and it is sometimes very difficult to, kind of, experience both of them and in my life recently I have experienced this feeling of sadness and this feeling of happiness almost on the very same day. So yes, I became a mother, I gave birth to a baby. This is how much my life has changed and the happiness that is brought because of the baby is just enormous. It is, again, very difficult to describe. But yes, there are phrases. Yes. There is this kind of language that helps you to do it. And apart from just saying that you are happy, that you felt happy, that it was very joyful, a super joyful event in your life, you can use other expressions. Some of them are very funny. And once again just like with the feelings of sadness. I’d like to tell you how to understand them and how to use them. And again how to associate them with different expressions and in this way, that’ll be easy for you to so remember them. So if you are very happy and you can imagine how happy I am, you are on cloud nine. Yes, and this is easy, I guess, to understand why when you are happy, you are on cloud nine because you are somewhere there up in the sky, just flying in the clouds. Super happy, super light. You can also feel like a dog with two tails. I love this expression, obviously because I love the dogs and I can just imagine how happy a dog can be if it has two tails, or if it had two tails. Our dogs would be extremely happy. So this feeling of happiness, it is like being a dog with two tails. And there is another phrase connected with dogs. I love it. I have to tell you this is like one of my favorite because you can also feel as happy as a flea in a doghouse. How happy a flea can be in a doghouse? Of course this is not something I would like to experience for my dogs. But if there is this flea and if she lives in a doghouse with a dog, she must be very happy. You can also be happy as Larry. It’s difficult to say, I mean, there are some speculations, it is difficult to say who actually Larry was but there is this speculation that he was a sportsman, a boxer, as I believe, and he won some big prize and the next day there were headlines in the newspaper and Larry just said that he was happy and that is why we say that you can be as happy as Larry. You can also be on top of the world because you feel like a king or a queen, that you can do anything, that anything is possible. You feel so joyful. You can be over the moon, so this traveling, this traveling up in the sky, it is something very much connected with this feeling of happiness. So let me repeat, so there is cloud nine, you are on cloud nine, you are on top of the world, you are over the moon and you are also in seventh heaven. In Polish, I guess we have this very immediate equivalent of this expression in seventh heaven. In Polish this is exactly what we what we say. You can go to the city centre and you can paint the town red if you’re happy. But this expression, I mean paint the town red is this kind of expression that I wouldn’t use just saying that I’m happy. So I’m happy and then I say let’s paint the town red. But this feeling of happiness with painting the town red is directly associated with partying simply, with going out with your friends, with eating out and having this great time. So, the phrase, the expression have a great time it is something, I believe, known to you, but I don’t know if you know the equivalent, some other expression, which is have a whale of time. A whale, so there is this big animal and you can say that you have a whale of time. You can also be tickled pink. I like this expression very much. Why? Because I like the word tickle. So if you tickle somebody, you make them laugh because you touch them in those very special places and people simply just keep laughing. Because you keep tickling them and these places, special places on the body that make them laugh. And if you are this very very happy, you are tickled pink. I’m thinking about these expressions that I would use when I became a mother. It is actually very difficult to choose one because these emotions are very hard to describe but I would go for these emotions that are connected with the sky so I could say that I was on cloud nine, that I was on top of the world, over the moon and in seventh heaven. Let us come back now to the word pink. Pink, as the color, is very much used in different phrases, in English. And the first phrase, I guess, that comes to our minds is this phrase that has this immediate equivalent in Polish because we can have those pink or we can have those rose-colored glasses and there are a few varieties of this expression. So you can see through rose-colored glasses or you can see through rose-colored spectacles. You can also look through rose-colored glasses and you can look through rose-tinted glasses. And here comes the word tint. Tint can be translated as color, in the broad sense, but I would rather go for hue or shade, by the way, do you remember the song Whiter Shade of Pale, one of my favorite. So remember, tint is the shade. But tint, I hope this is some interesting piece of news for you, tint is the expression that can be used to describe this very special type of cosmetic. I believe that most women use it because you have two types of taking care of your hair. I mean you can go to a hairdresser and you can dye your hair, like permanently, change the color of your hair, but you can also use tint. And tint also dyes your hair but this is not permanent. So and you can actually do it in your own home. So, you just buy the type of tint that you like, that you want and you just wash your hair, you use it like a shampoo and then you change your color. So, please remember the word tint and what it describes. Happiness, yes, we’re talking about happiness. We’re talking how happy you can be and how to describe it. And if you are super happy, you can say that you burst with joy. The verb burst is also one of the verbs that I like very much because the very basic meaning of this word is associated with this sound, with this action that is produced when balloons burst. Some of you I believe you don’t like the sound very much. I don’t think I like it myself either but, yes, balloons when they get too big, they burst. And another usage of the word burst, and this is something I also repeated on many occasions that in English we have different words that have the very basic meaning, are used in the very basic sense, but they are also used in this figurative sense. And the word burst, which is originally associated with balloons, with the sound, the word burst can also be used in another context and this context is that you burst into tears or you burst out crying. So, the expression burst into tears and burst out crying would rather go to the first part of this podcast, so how to talk about sadness, the feeling of being sad, but here when we are talking about the positive feelings, we can say that you you can burst into laughter and you can burst out laughing. If you’re very happy, you produce a smile on your face and the special smile that appears on your face, this very broad smile, a big one with your teeth out, showing your teeth, it is called a grin. So you can grin and if you are that very happy, you grin from ear to ear. And yes, I was grinning from ear to ear when I was given my baby, when I saw the boy for the first time. Grin is very productive as a word and it is used in other phrases and another phrase, not associated with happiness here unfortunately, is grin and bear it. So you can grin and bear something and this expression is used when there is a situation that you’re not very happy with but you have to face it, right, so there is something that you don’t like, there is something that is not a favorite thing of yours, but you just grin, pretend and you bear it so you just stand what is there. The last expression for today would be happy-go-lucky. I wouldn’t say that it is directly associated with the feeling of happiness. That would be rather associated with a feeling of carefreeness, but the expression happy-go-lucky is just this positive one. So, that’s why I decided to introduce it. There was this film entitled happy-go-lucky and I think that I am this happy-go-lucky person right now. I mean, on the one hand, I’m super responsible for the little person, but then I’m just happy-go-lucky because I wake up every day with this smile on my face. I hope the expressions that we have talked about and I hope that the events that I have introduced, they will be remembered. So each time there is a change in your life, you can describe it. You can use some expressions and English offers you a wide range of expressions to choose from. Unfortunately or fortunately, there are these different emotions in our lives. 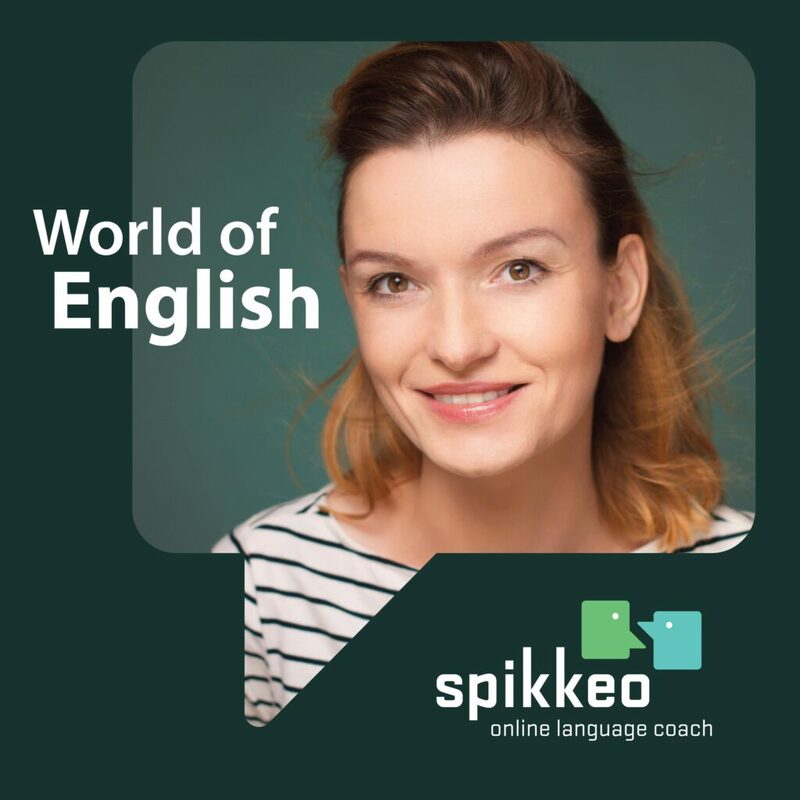 Of course, everybody would love to experience just the feeling of happiness, but there is also this feeling of sadness and with this podcast I hope you will know how to talk about these emotions in English.